Wednesday: Clouds to mild sun. Highs around 80. Overnight Wednesday: Mostly clear and crisp. Lows around 50. Thursday: Cooler, fair. Highs in the 60s along the coast, 70s inland. Gray skies should brighten rapidly today, with temperatures rebounding nicely to near 80 degrees for most by the afternoon. The low pressure the caused the rain last night is racing away, but a second front out of Canada is crossing New England from north to south, generating a quick shower in northern and eastern areas, or a possible brief thunderstorm in the state of Maine. Cooler air will work in overnight, with high pressure from Canada building. A northwest breeze at 10 to 15 mph with low-temperature tomorrow in the 30s far north, to 40s and 50s south. This cool high-pressure brings nice weather, sunny with highs in the 60s to low 70s. That same high-pressure system gets south of us Friday becoming a source of warmer air. 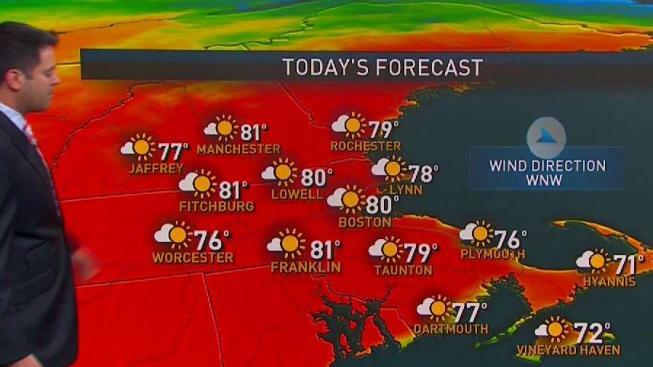 Wind from the west warms temperatures to the 80s. Humidity is not too bad on Friday. It does become warm to hot and humid on Saturday, with a high temperature well into the 80s. Wind from the southwest become gusty and afternoon thunderstorms possible and central and northern New England. The next front crosses New England from north to south Saturday night and Sunday with a chance of a few showers and a thunderstorm along with cooler air. At no point does it look like a big washout, but Sunday may end up rather damp. Monday is also a tough call with a storm forming at sea. It may stay far enough away for sunshine or come close enough to be wet. Either way, it looks much cooler on Memorial Day.